Shoe Personality: How High is that Heel? 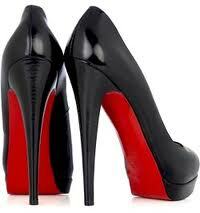 I've often been asked how high a heel is, and just how exactly does one measure the height?? And what if the shoe has a high platform? Does the platform count as part of the heel height or is it in addition to the heel? Measure the heel itself along the side of the heel, up to where it meets the sole; measurements are not exact since the number is rounded down to the nearest quarter inch. Usually, heels are measured from a size 8.5 shoe and it will vary a bit based on the size you wear. Platform: The height of the platform is not in addition to the height of the heel. What's flat, low or high?